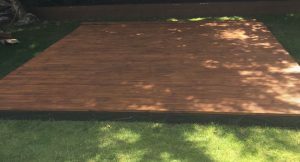 How to make a simple 3.6m square garden decking base. 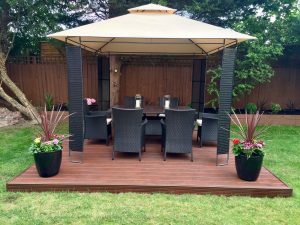 As you can see from the image our customer has used this decking area to provide a raised platform for their garden dining furniture and gazebo. The decking area was laid directly onto the ground this is often known as using a floating frame. 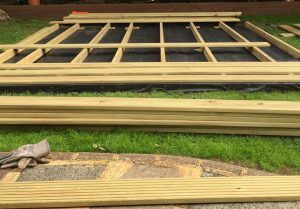 For this project our customer ordered 27 decking boards, 10 lengths of 3.6m 4×2 (90mm x 45mm) tanalised timber, 2 boxes of decking screws, 1 box of timber drive screws and 4 square meters of weed membrane. We delivered the decking boards and timber to Ashford in Middlesex where our driver unloaded and helped the customer place the timber in the back garden. Firstly an area of lawn was marked out as a square using 4 lengths of the 4×2 timber. To get the angle and visual effect required they used the angle of the raised railway sleeper flower bed as the straight edge. For extra detail and something to bare in mind they also made sure they could get the lawnmower around each side of the completed decking. O nce happy with the position of the square frame they removed the turf, leaving a square of top soil. They then laid lengths of the weed membrane over lapping the joins and tacking the ends to the timber frame. From the top image you can see that the decking boards were laid horizontally across the frame, therefore the 4×2 frame timbers needed to be laid vertically as you look at the image. The 4×2 timber was spaced out every 2 feet (600mm) this gives a nice firm base and stops bounce in the decking boards. The frame was screwed together using the timber drive screws. They are long screws with a hexagonal head, the pack of screws comes with a drive head which can be fitted into an electric drill. The ground was pretty much level although you can see that under some of the joists small pieces of wood were placed to support the joists. Next the decking boards were laid, being careful to get the first board nice and straight across the sub frame. 2 screws were driven down between the decking ridges into every timber joist. The decking boards were quite wet on arrival so we advised the customer to lay the boards tight against each other. As the boards dry out a small gap between each board will naturally appear. If the boards were already dry its a good idea to leave approx 3mm (width of the decking screw) between each board. 4 decking boards were used to make front, back and side fascia panels. These were trimmed down with a jigsaw to get the required height. The decking could have been left with its natural look because the boards already have a pressure preservative tanalith E treatment which protects against rot decay, insect attacks and fungal. However to blend in and match with surrounding wood features in their garden our customer decided to use a decking stain. Our customer told us this was his first ever attempt to lay decking. It took him the weekend to complete the project and by Sunday evening was enjoying his first BBQ meal seated on the decking area.